When I adopted Moxie several months ago his wings were clipped. After reading the reasons to let a parrot be flighted, I'm going to have a go at letting Moxie's wings continue to grow out. Besides the concerns of the bird escaping, I'm concerned too that he'll fly and land on my husband. There's a mutual dislike between the two and as it is, if my husband gets too near the parrot play stand, Moxie makes the short flight to my husband's back and then starts his evil-twin Senegal 'laughter'. So far I've been there to intervene, but that little bird has, well, moxie, and my husband isn't interested enough in dealing with even a complacent bird much less befriending this one. If letting the wings grow out causes my husband to get targeted by this little parrot, I'd rather Moxie lost his ability to fly than to have to look for a new home for him. This is a big question Michael,. I lost a fully flighted cockateil when she spooked and hit a wall hard by breaking her neck. If she had been clipped she would not have hit so hard, and may still be alive today, but that is something I will never know for sure. i also ran over to my friends place when her male cockatiel managed to fly outside because her son didnt close the back door properly. he flew high into a tree, and we tried for hours to get him down, but then a hawk swooped down and grabbed him. My friend was so upset and blamed herself for being to lazy to clip him. She was pretty mad at her son for a while too. It is the sad truth that most parrots lost outside were not clipped, but these days there are so many who are against clipping and do not use common sense to judge each situation. Flight harnesses are important for a flighted parrot to go outside. I am too worried about the amount of hawks in this area and so I tuck my parrots under a jacket to transport them or in a small travel cage, so they only fly in the house. I have purchased clipped parrots and have seen their confidence build as they fly bettter, so was glad to see those parrots begin to fly better. I alway let mine have enough flight, that it works in my home. I teach them to offer a wing and only clip one on each side at a time letting them adjust in between and seeing how much that has affected them, before any more decisions. I do not believe in a severe clip done all at once as it is very traumatic to the parrot. They should be able to fly bettter than simply gliding to the floor or they wont even try to fly much. Right now both of mine are flighted but I will always make decisions based on what is best at the time for the best quality of life I can give the parrots I live with. Most parrots are not clipped because people choose to keep them flighted because its normal for a bird, they are supposed to fly.I think clipped birds get hurt a lot more they can easily be attacked by a dog or cat or other animal and cant fly away or can be accidentally stood on many things can happen.My English budgie was clipped and my sister accidentally jumped beside him and he got a fright and had a heart attack. ParrotsForLife wrote: Most parrots are not clipped because people choose to keep them flighted because its normal for a bird, they are supposed to fly.I think clipped birds get hurt a lot more they can easily be attacked by a dog or cat or other animal and cant fly away or can be accidentally stood on many things can happen.My English budgie was clipped and my sister accidentally jumped beside him and he got a fright and had a heart attack. Well I am not really for or against clipping. I look at each situation and make each deciesion based on the household at the time. I would never have a dog or cat and parrots at the same time. But some choose to do that or already have other pets when they get their parrots. I have only adults in my household and my frequent visitiors are my daughter and granddaughter who have parrots so they know how to be around them. Any other visitors and my parrots are in their cages. I am for making a decision based on what fits wth your home and modest clipping slowly done when necessary. You need to do what works for you, and no one can make that decision for you. After all, you have to live with the consequences of your actions. I think people should just think what if there was no such thing as clipping what if it didn't exist that way there would be more people solving their problems and finding whats best for a flighted bird. Yes but they are fully flighted outside, inside a home is a different situation. My wish is a different than yours. My wish is that people will research a lot but then use their free will to access each situation and make ther best choice depending on the situation and circumstances. But I respect your wish, and the good heart you have for animals. At the rate we are overpopulating the earth and destroying natural habitats, parrots may one day only exist in captivity and many more species will be lost forever that cant adapt to living with humans. The clipping issue is one that is important to talk about, and when I was younger and less experienced, I did feel birds should not be clipped, after all my mohter had budgies when I was growing up and they were never clipped. This changed as I was exposed to more experiences. All the clips I had seen were too severe, and it took time and experience to realize that clipping could be helpfull in some situations with modest clips. Most of my regrets about living with parrots are when i just went with what the majority felt, instead of doing my own research, my own thought and inspiration, and my own carefull observation. 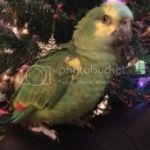 Forums can be a wonderful place to come for information and/ or just to have someone to talk to about your parrots, but any suggestions should be looked at as just another suggestion and no more. There is no substitute for doing your own research and learning about your own birds and yourself so that all of these sources of information can assist you in making the right choices for you and your bird. We have a B&G macaw that has not been clipped and does not know he can fly. He is very well behaved. We have a goffin cockatoo that came clipped and then we allowed him to become flighted. The goffin immediately started flying to the B&G's cage and play ground and displaying aggression. We were constantly running to prevent a fight and injuries. This went of for a few weeks. We kept thinking the goffin would stop challenging the B&G. The goffin's behavior towards us became more ornery as well, as he would dive bomb our faces. We were afraid he would get hurt as some people naturally block their faces or swat with their hands when something is aiming straight for their face. So we did clip the goffins wings again. He pouted for about 30 mins and then became the best behaved we have ever known him to be. I know this goes against every thing that all of you write about and I am sure I will get nailed up against the wall for being honest and writing this, but you asked and I am telling our story. You are not going to get 'nailed to the wall' but you are going to get people disagreeing with you. I am one of them and have just two points about the subject. The first point is that birds need to fly and clipping them is unhealthy and unkind to them. And that point alone is enough for me because, to me, their wellbeing comes first. But the second point is that there is no need to do it because other people have found ways of stopping aggressive behavior without resorting to it. I am not trying to put you down, mind you, but think about it, if clipping was the ONLY way people had of keeping birds from being aggressive to other birds or people, every single captive bird would be grounded - but they are not. And, as a matter of fact, clipped birds are not only in the minority now (when the pet parrot fad started, they were all clipped), the number continues to decrease as people become more knowledgeable. So, in my personal opinion and like politicians like to say nowadays, you are in the wrong side of history.